Pedestrian Rollers are single drum walk behind rollers that are ideal for tight access areas and small areas. Packing a lot more compaction than a vibration plate they ensure a well compacted surface for block paving or tarmac. Many comes with an optional hydraulic breaker take off to power hand held hydraulic breakers. 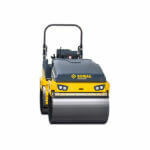 We stock Bomag and Hamm 80 Rollers, and both are exceptional rollers and all of them are new and are the latest models. 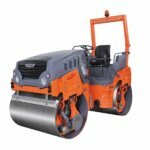 The 80 Roller are surprisingly 80cm wide and put down approximately 8 tons of compaction force, vibrating on both front and back drums. Our rollers come with a fold down roll over bar and green seat belt beacons and working water sprayers. 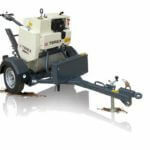 The 120 Roller is ideal for car parks and roads, putting down an approximate force of 12 tons. With a width of 120cm's and a fold down roll bar frame they are excellent rollers. 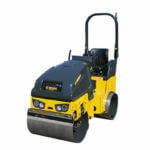 The vast majority of our 120 roller fleet are the latest Bomag AD-5 model and we also stock the HAMM HD12 rollers. All come complete with working water sprayers and green seat belt beacons. Trench Rollers are great for compacting trenches (hence the name! ), they are operated by remote control which makes them a lot safer than using a sit on roller for trench work. 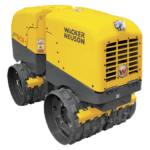 They also come with the Compatac compaction system from Wacker Neuson which indicates when optimal compaction has been achieved.